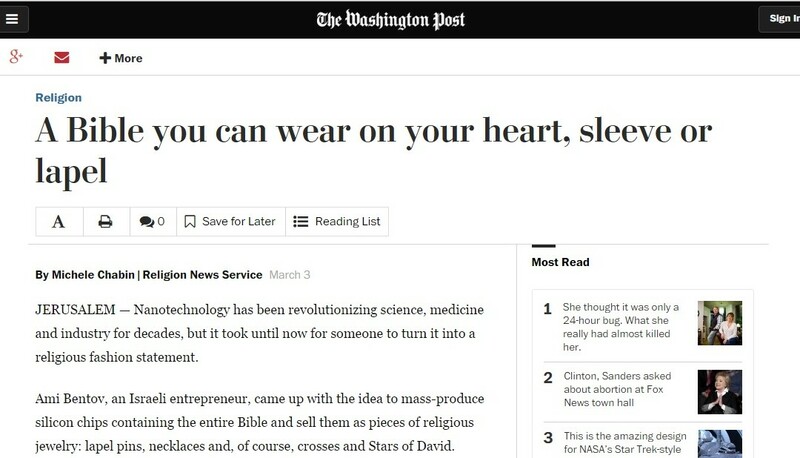 JERUSALEM — Nanotechnology has been revolutionizing science, medicine and industry for decades, but it took until now for someone to turn it into a religious fashion statement. Ami Bentov, an Israeli entrepreneur, came up with the idea to mass-produce silicon chips containing the entire Bible and sell them as pieces of religious jewelry: lapel pins, necklaces and, of course, crosses and Stars of David. The company’s goal is to make the wearable Bible affordable and accessible, if not exactly practical. Bentov, the founder of the Jerusalem Nano Bible, partnered with TowerJazz, a semiconductor company, to create pin-sized nano versions of the Old and New Testaments. The former contains all 24 books of the Hebrew Bible written in the original Hebrew. The latter contains the entire New Testament, written in Greek. An English-language version is under development. The Jerusalem Nano Bibles are made from silicon wafer, a thin slice of semiconductor material, derived from sand and generally used in precision printing of circuit boards. The company transforms a text file of the Bible into an actual image, or photograph, that is projected onto a 5-by-5-millimeter wafer surface covered with a protective layer of silicon. Each letter is 600 nanometers wide, narrower than a strand of hair, whose width is roughly 100,000 nanometers. Due to its size, the Nano Bible’s text can be read only with an electron microscope, which uses a beam of electrons to magnify objects a thousandfold. When Bentov saw how nanotechnology was used in the media production world, something clicked. “I realized that I could use the same technology that was being used to make cellphones and computers, the same devices that are driving people apart these days, to create something that will bring people closer together. Closer to their faith, to themselves and to each other,” he said. In marketing the Jerusalem Nano Bible, the company has reached out to Jewish and Christian believers worldwide. “Our jewelry line has sold by the thousands all over the world,” said Hadas Tzur, Jerusalem Nano Bible’s chief operating officer, of the company’s necklaces and lapel pins. Jerusalem Nano Bibles are on display in several museums and in private collections, she added. An unadorned Nano Bible in a box costs $25; lapel pins, $40; and necklaces, including crosses and Stars of David with embedded Nano Bibles, from $90 to $150. The Bible chip is available for licensing to jewelry makers and others who wish to incorporate it into their original designs. Marlena Ariel Geren, a Christian from Pennsylvania who has purchased both New and Old Testament Nano Bible products, called them the greatest gift.